Tips for Proper Storage of your Homemade Jerky | Bigwig Jerky Co.
Winter is coming, and it’s a good time to stock up on the wonderful thing that is beef jerky. Now, if you are going to make lot of jerky, you need to know the proper ways to store this great snack! After drying the jerky, there are many ways to store it. Some people will store it inside ziploc bags but the correct way to store your jerky will really depend on how your have produced the jerky. The best option is anything that is airtight. The vacuum will never allow the microorganisms to enter and breed in your jerky! However, if your jerky is not dried out enough, the moisture inside the packaging will cause mold to grow. Good portioning will also affect the lifespan of your jerky, but if you are to store a huge quantity of jerky, it would be better if you have them stored either inside plastic containers or a jar. If you are planning for a large quantity of jerky, you should invest in small oxygen absorbers so you will again be able to control the amount of oxygen and ultimately moisture depriving the bacteria to grow inside the containers. You can buy oxygen absorbers online from ebay or amazon. 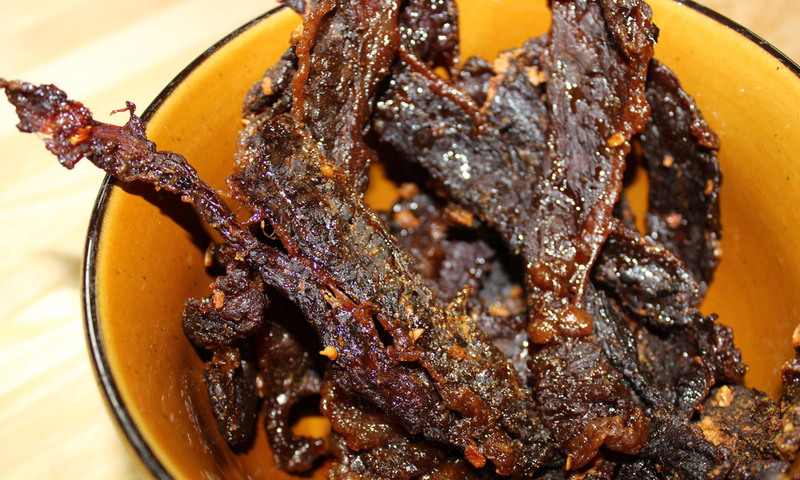 For proper storage of jerky it should be kept at a suitable temperature to increase the lifespan of the jerky. Storing the jerky or hanging it just inside your home is not advised, unless you live in an area with low humidity but the best thing that you could do is to store the jerky in your fridge. This will give you months. Another tip for storing it inside the fridge and for extending its lifespan, is to have it stored at the back section and never near the door where it can be susceptible to bacteria that is from outside the fridge. You should also check your jerky regularly for any signs of mold, often some white mold may appear but this is quite common, especially with biltong and can be wiped away with vinegar. If you are not sure, it’s best to throw the jerky away – especially if the mold is a different colour. Including certain spices or ingredients in your recipe will also help with the longevity of storing jerky. Spices will also help to eliminate and prevent the bacteria to inhibit the meat plus; it will always be an advantage for the flavors. Just make sure that everyone in your family likes the spices used. One tip is to use vinegar in your recipe as this will keep the ph at a level that prevents bateria from growing. These are the tips that you need to remember so for you to have a proper and healthier ways of storing your jerky. After all, you will have an effortless snack anytime you want. Healthy, and fresh every time you would like to munch some jerky treats, it would also be safe for your pets if you want to share some. Remember, quality is invested, so you must also invest in the equipment and things that you can use for you to make and store your jerky.